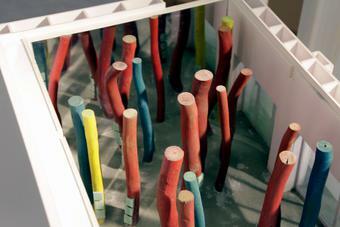 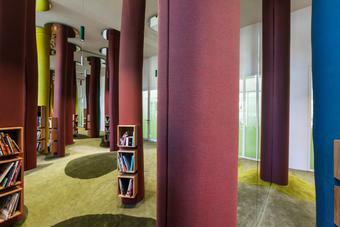 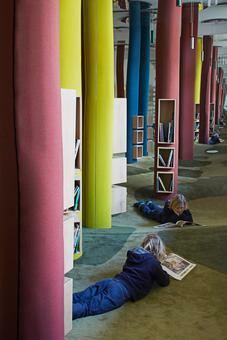 This site-specific artwork inserts sixteen colourful tree trunks into a rolling landscape within a children’s reading room. 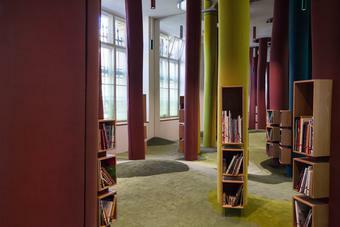 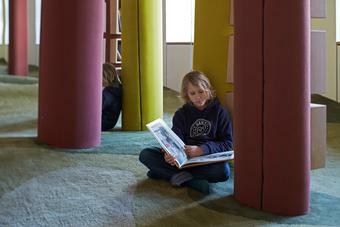 Located in the grund_schule der künste at the Berlin University of the Arts, the work was developed in dialogue with Kirsten Winderlich and responds to her concept of a Bilderbuchwerkstatt (German: picture book workshop), a space that welcomes children to discover art and books. 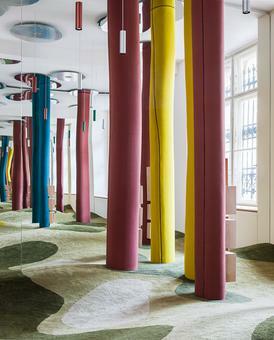 The artwork’s subtly bending trunks – wrapped with woven wool manufactured by Kvadrat and dyed in variations of the primary colours – emerge from a green piebald carpeted landscape and stretch up to the ceiling, where they meet rounded mirror plates. 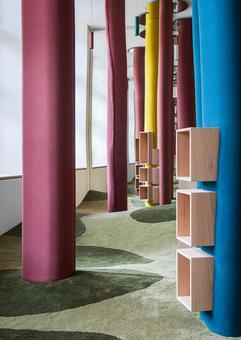 Installed into the trunks are wooden compartments that serve as bookshelves, and on two facing walls of the room, full length mirrors serve to multiply the space and expand the landscape of trees. 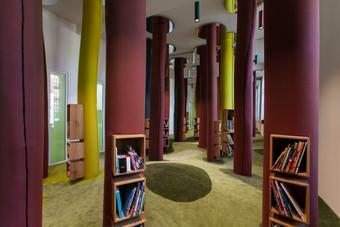 The room is lit from lights suspended from the ceiling and naturally from two windows . 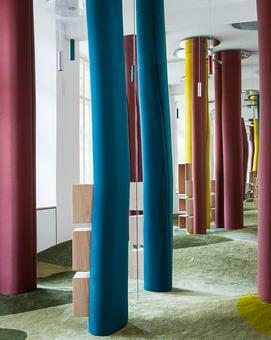 A green gradient, fading upwards from opaque to transparent, is set into these windows as well as into three full length glass panes that flank the space’s entryway. Upon entering the space, visitors remove their shoes; a series of drawers integrates into the carpet landscape to hold the footwear.